Buttermilk Waffles - Just like the diner! 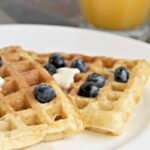 Home » Recipes » Breakfast » Buttermilk Waffles – Just Like the Diner! 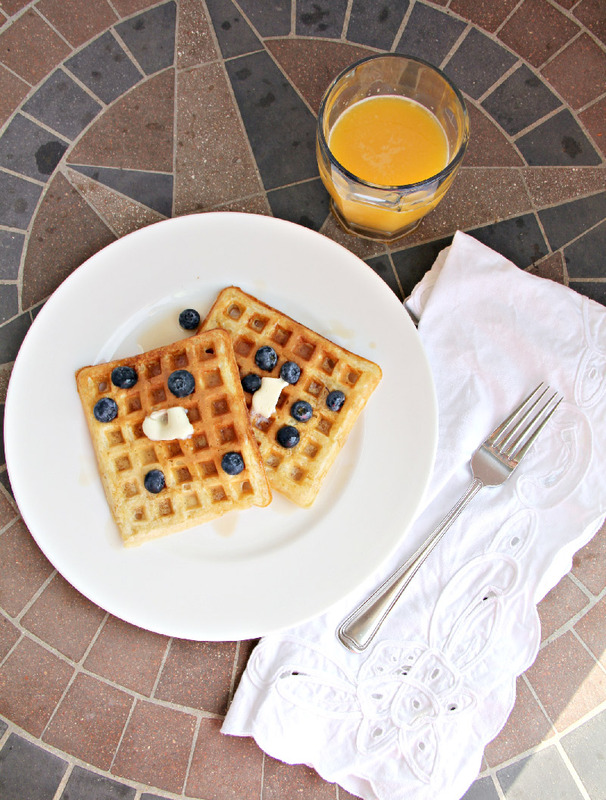 Buttermilk Waffles – Just Like the Diner! Buttermilk Waffles—Just like the waffles from the diner! You can make a big batch and keep some in the freezer for quick and easy breakfast! Y’all, you can’t even imagine how much we are enjoying our new lifestyle. 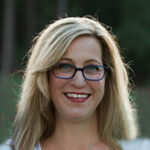 It’s so cool to be able to walk downstairs and have a drink or meal—that someone else is responsible for cleaning up! One of our favorite things has been trying new places for Sunday brunch. We are so much closer to in-town Atlanta now and the possibilities are endless. A couple of weeks ago we ended up at Paces and Vine and David had shrimp and grits, which were absolutely some of the best I’ve ever tasted. Virginia ham. Bell pepper tomato jam, which I could have just eaten with a spoon. Poached egg on top (which I could do without but he liked it). I’m pretty sure I ate half of David’s shrimp and grits, but I also had the Malted Pecan Waffle and I think it was the best waffle I have ever eaten. Ever. It was seriously that good. As good as my buttermilk pancakes. And so good that I had to try and recreate it with my own waffle recipe. I didn’t add the pecans or the apple compote, but this simple malted buttermilk waffles recipe turned out to be pretty darn close. And the secret is the malted milk powder, so don’t leave it out! It’s what takes this buttermilk waffles recipe from plain old waffles to out-of-this world waffles! Don’t you love waffles? They’re just fun, with the little nooks for melted butter to hide in and maple syrup to huddle in. I hope you enjoy these and make them for your family! What’s your favorite breakfast or brunch food? Waffles? Pancakes? French toast? Or something else? 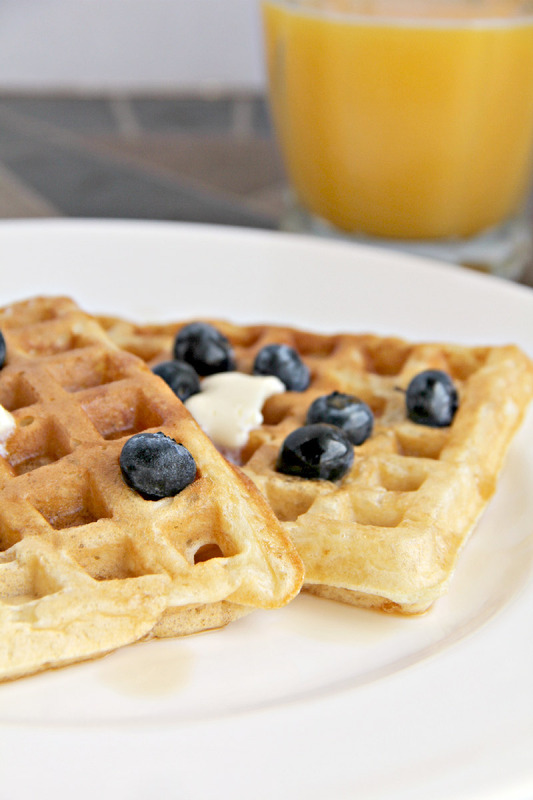 Buttermilk Waffles--Just like the waffles from the diner! You can make a big batch and freeze some for quick on-the-go breakfasts. Preheat the oven to 200 degrees and have ready a large baking sheet. Preheat and lightly oil a regular waffle iron. In a large bowl, sift together the flour, malted milk powder, baking powder, baking soda, and salt. In another bowl, whisk together the buttermilk, butter, eggs, and vanilla. Add the buttermilk mixture to the flour and stir just until combined. The batter will be lumpy. Spoon some of the batter onto the waffle iron (the amount depends on the size of your waffle iron--mine makes 4 waffles at a time so I put slightly less than 1/4 cup on each space) and cook until the waffle is brown or until waffle iron indicates ready, usually 3-4 minutes. Transfer waffle to baking sheet and keep warm in the oven. Serve waffles hot with lots of extra butter and maple syrup. 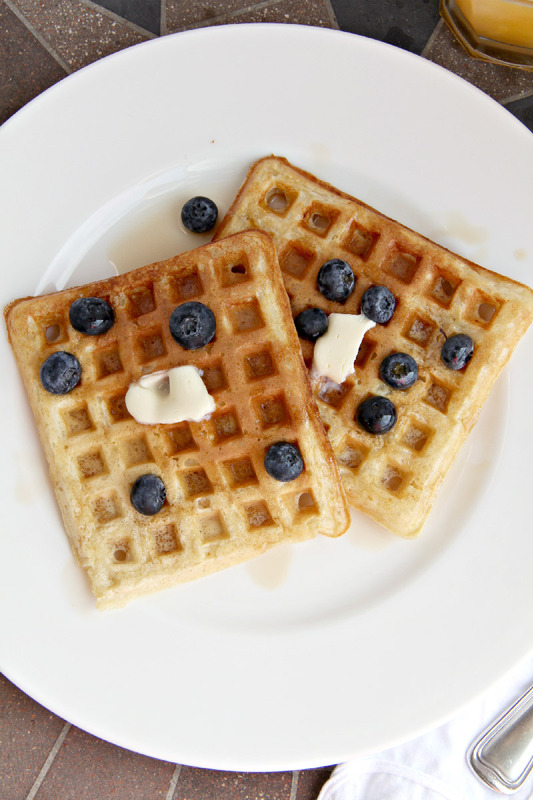 **To freeze extra waffles, set unstacked on a baking sheet in the freezer. Once the waffles are frozen, wrap single waffles in wax or parchment paper and place in freezer storage bags. To reheat, place frozen waffle in toaster. Hi Lucy, This looks fabulous! We’re still enjoying the homemade granola from your recipe too! So good to see you last night!